If buying a Go-kart is too expensive for you why not have a go at building your own instead? This is a great way to feel more involved in your Go-karting - it's much easier to feel attached to your Go-kart that you have built (or at least helped to build), compared to one that you have bought. It also tends to be much cheaper than buying a brand-new Go-kart, which can often cost in excess of £3000. 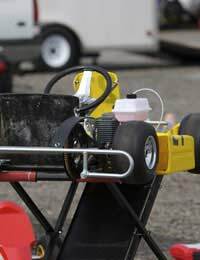 This article focuses on the materials that you'll tend to set up your Go-kart. Building a Go-kart is not particularly difficult, but you do need to have a good idea of what you're doing. There is a lot of welding involved, which can be dangerous, and needs to be carried out by an adult (preferably one who is an expert welder). As well as being dangerous, welding around corners can also be very challenging. Tubing is one of the main materials used in building a Go-kart. It is mostly used to build the frame of the Go-kart, which needs to be both strong and light. Tubing that is around one-eighth of an inch thick is usually recommended. This can be either the round or square variety, or both if you prefer. Many people use a mixture of both, as square tubing is difficult to bend. It is also easier to weld square tubing to round tubing than it is to weld round tubing to another piece of round tubing. Angle iron that is one inch by one-eighth of an inch is another good option, as it is easier to bend. This will make the job a whole lot easier. Making bends is simply a case of notching the material, heating it and then bending. You can add filler to the notching to make the frame stronger again. Lawnmowers often have lots of parts that are ideal for building a Go-kart, so keep an eye out for gas tanks, steering wheels, pulleys, tyres and wheels that you can use. Avoid lawn mower engines, as they aren't suitable for using in a Go-kart without being rerouted. Use a vice grip to hold your tubing in place while you cut it. This will save time, as well as making sure that the pieces are exactly the same length. Make your cuts before you start welding. It will be obvious at this point if your pieces don't measure up, and this will save time in the long run. If someone else is going to be doing the welding, you need to be everything in place so that they can just get on with the job. Most cheap bending tools won't bend square tubing. For tubing that needs to be bent, angle iron is a better bet. It bends easily after being heated, and you can fill in the gap with filler afterwards. Cut the wood for the base and back rest, and then cushion it with foam and vinyl after the frame has finished being welded. The practical side of actually putting together a Go-kart is very technical. There are many in depth plans available, which can be bought relatively cheaply from various companies.